It’s a stir fry kinda week with a couple dump and cook meals sprinkled in. I’m loving Chinese food of late. It’s a little addictive and adds an exotic spin to a regular stir fry. Plus you get to use those chopsticks in the bottom drawer. I’ve been working a lot more than usual this week. My CEWK Blog is hitting crazy numbers so I am super motivated right now. It’s humbling to see so many people reading what I write so I’m trying hard to deliver as much value as possible (to spare my Clean Eating Moms the blogging from home stuff, I’ll stop here and if you would like to know more about the blogging thing, go here). Last week was a great week in so many ways. We actually stuck to our budget and ate clean MOST of the week. Except for one day. It was late and I happened to be parked right outside an amazing Chinese takeout. They were cooking all this tasty looking food right in front of me. I lasted all of 7 minutes before I caved. It was mostly good. Except for the copious amount of sugar they must add to make their sweet sticky chicken. Mental note to self: Use the parking on the other side of the building when hungry. Maybe you will notice that this week I am looking to remake a healthy version of that sweet and sticky Chinese chicken at home. Check out Tuesday nights dinner plan. It’s a whole lot cheaper and with only a little sugar added. Sunday is my Meal Planning Day. I decide on seven Dinner Recipes, three Breakfast options and the two Baking recipes I’ll be making for the week. 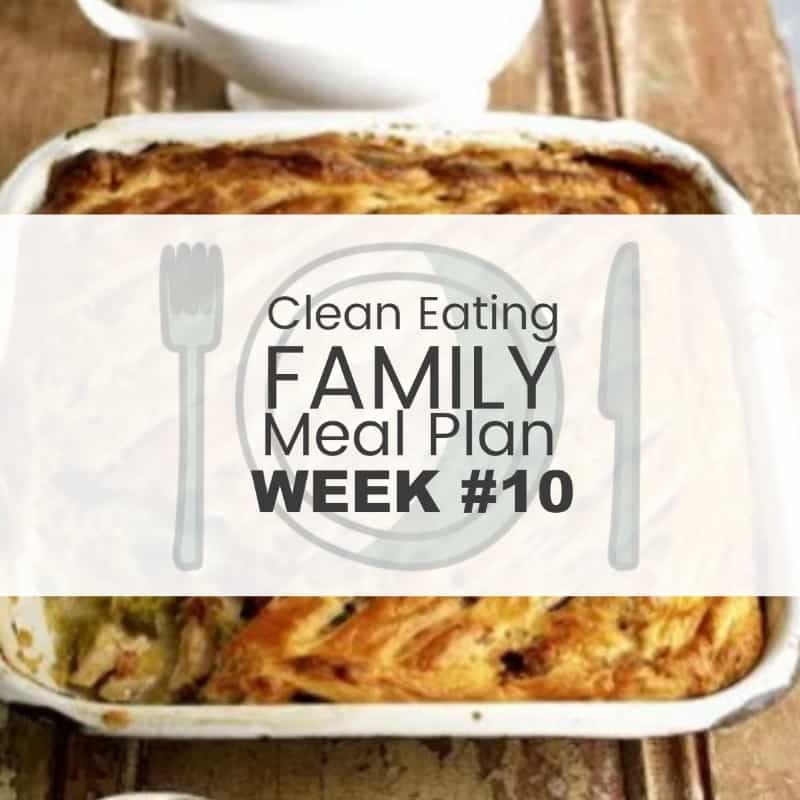 You can read more about how I meal plan here. Homemade Pizza and Salad – If you haven’t tried it yet – you are missing out!!! 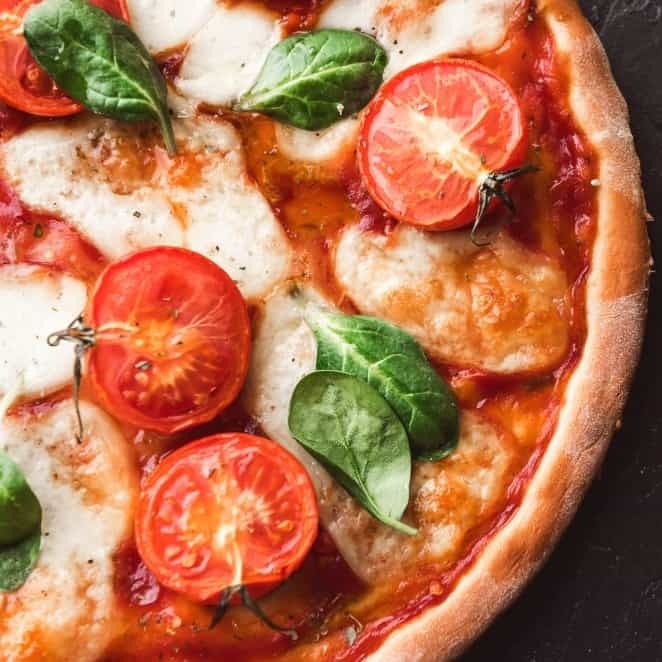 This Two Ingredient Pizza Dough is brilliant. It takes about 3 minutes to make and never, ever flops. Top with your favourite toppings and you have a homemade pizza that knocks the socks off any takeaway. 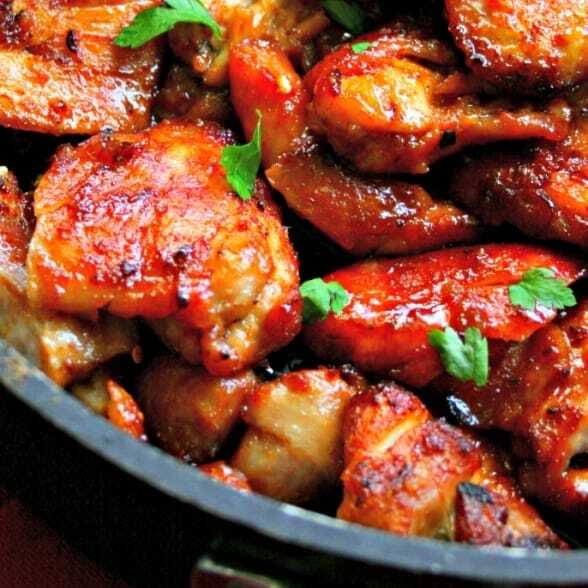 Sweet and Sticky Chinese Chicken – This is crazy good. The flavor is incredible and all I can say is this – make more than your think you need. Serve on a bed of basmati rice and shredded vegetables (We like to sprinkle with a little tamari sauce as a dressing too). Sweet and Spicy Chicken Recipe here. 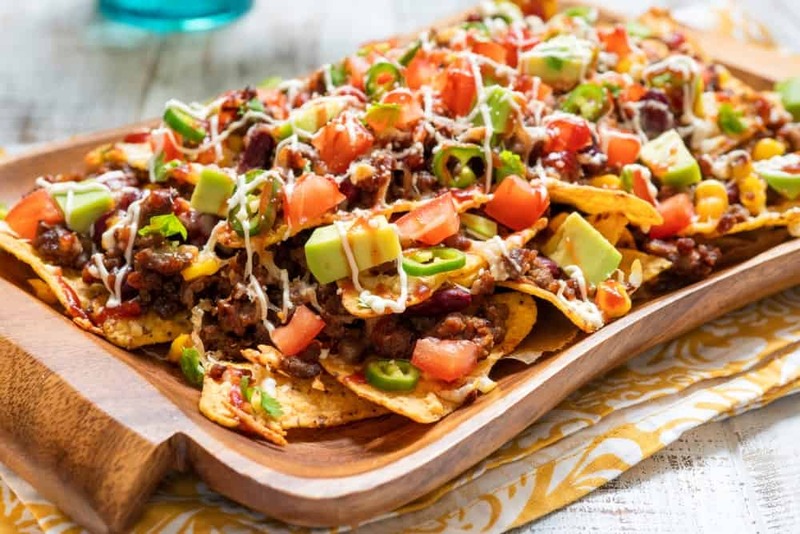 Nachos – Sometimes you just feel like a massive tray of loaded nachos (especially when you have 4 gorgeous Avocados you need to use up in one night). Shop for Clean Eating Tortilla Chips on Amazon. Pesto Chicken & Mushroom Pasta– I make this recipe pretty regularly (about once a month). It’s a family favorite. I always make sure to make a little extra for school lunches the next day too. 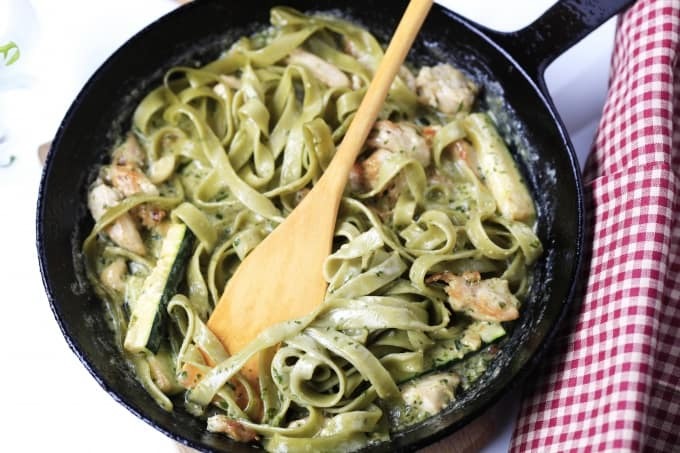 Try the Easy Chicken and Zucchini Pesto Pasta Recipe here. 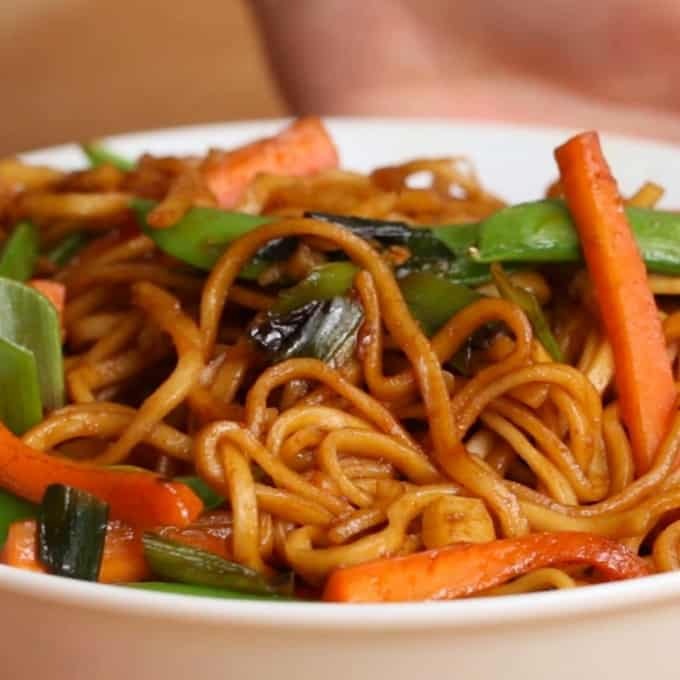 Vegetable Garlic Noodles – An easy weeknight stir fry. You can substitute veggies with whatever you have in the fridge. I like to throw in little canned sweetcorn too (the kids love them). Skip the vegetable oil and use either coconut, ghee or olive oil to keep it more within the clean eating guidelines. Get the Vegetable Garlic Noodles recipe here. 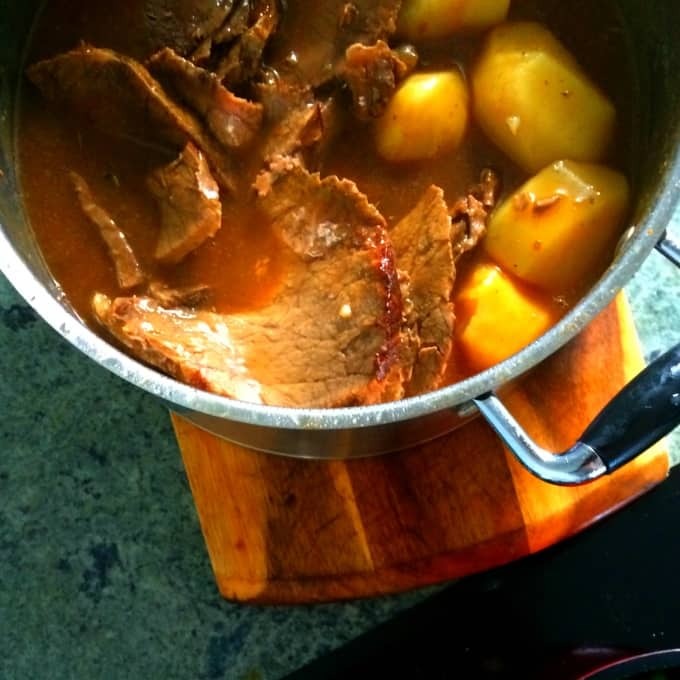 Beef Pot Roast – Always a BIG hit in our home. Takes a bit of time in the kitchen (around 20 minutes prep time) but after that, it cooks on it’s own. You can Find the Beef Pot Roast Recipe Here. 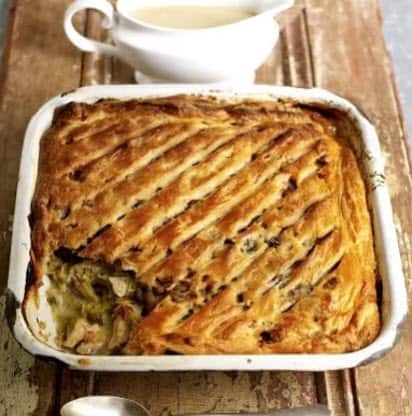 Chicken and Leek Pie – The BEST Pie EVER!!!! I use the Jamie Oliver Recipe with a couple tweaks to suit us: I use chicken instead of turkey. No bacon and I top with mashed potato instead of pie crust. OMG! Love love love this recipe! 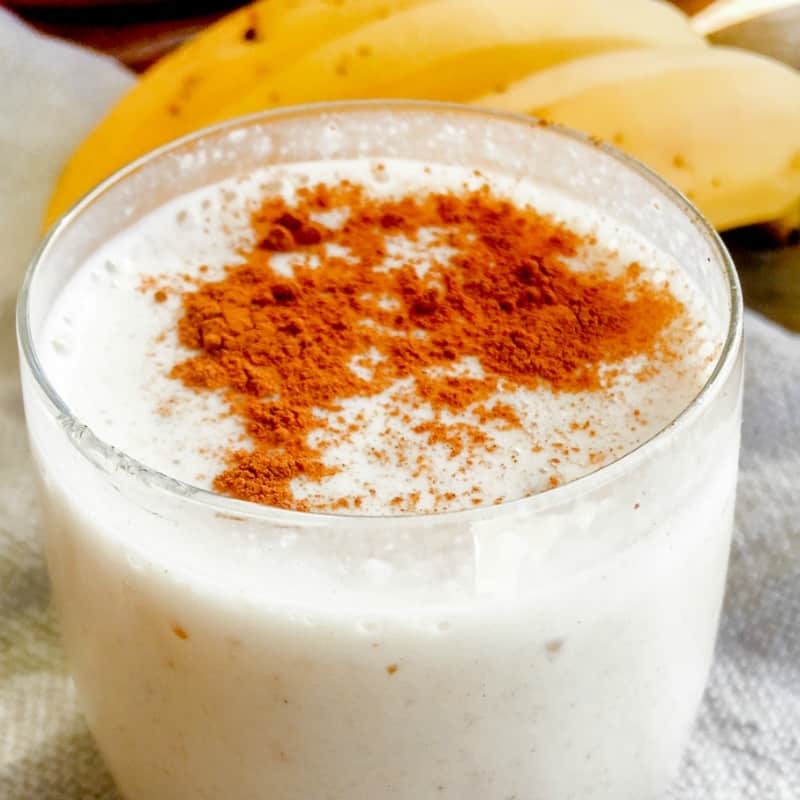 Homemade Protein Shake – OK, so this isn’t much of a baking week, but I will be making this Protein Shake A LOT. No Protein Powder. Just good ol’ real food.